Can You FEEL YOUR Vitamins Working? Can you actually feel your vitamins working? Do you spring out of bed every morning before your alarm clock goes off ready to take on the world? Was your sleep restful with minimal movement throughout the night and no stiff neck? If you answered NO, to any of the above, chances are you aren't absorbing all the vitamins and minerals that our bodies need on a daily basis. I know some of you are already thinking, "I eat clean everyday, I workout, I have the 20-30 supplements that I take and not looking for a change." I know I it hear it all the time. Let me take a moment to share some facts that some of you may not realize. Your health actually begins in the digestive tract. Do you have irregularities, stomach discomforts, and bloating? It could be what you're eating, maybe you don't have enough good bacteria, and or your body just isn't absorbing the nutrients it needs. Make sure you take notice when eating to find the culprit to your discomfort. Most people who are concerned with their health has a vigorous workout plan, strict diet plan, and have an array of supplements they consume on a daily basis, however, they are still EXHAUSTED, tired, moody, experience restless sleep, general aches, discomforts, etc. We as health coaches or personal trainers can't help with those battles although one is following a strict routine day in and day out. 80% of getting fit is what you're putting in your mouth and the other 20% is exercise. Have you ever really taken a look at what you're consuming? 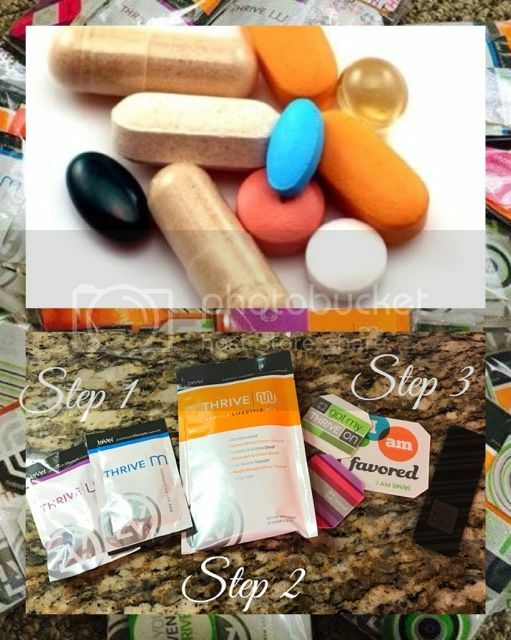 Do you go to the big box stores for your supplements? Is it because it's a well-known corporate chain? Those are just a few questions to ask yourself when starting a new vitamin/supplement to augment your nutritional intake. Made in a lab, who knows where? It is ultimately your decision on whether or not you feel your body is worth it. I know mine is! THRIVE consist of 3 simple steps (formulated for men & women) before you leave the house in the morning. Step 1: AS SOON AS YOUR EYES OPEN BEFORE YOUR FEET HIT THE FLOOR take 1 to 2 capsules with a full glass of water on an EMPTY stomach. Step 2: WAIT 20-30 minutes later and drink down your Lifestyle Mix (prebiotic/probiotic) with 8-10 oz of water. Step 3: Slap on your DFT to A CLEAN DRY LEAN area on your body (derma fusion technology) AND YOU ARE DONE FOR THE DAY. There is nothing else to do. Repeat the next morning changing out your DFT every 24 hours. EAT BREAKFAST afterward ALWAYS. Thrive is NOT a meal replacement or diet! It cost NOTHING to start a Le-Vel business or just to be a customer. Register right now for a FREE customer account and learn more information to living healthier and wealthier weeks, months, and years to come. I would personally like to connect with your to Start your THRIVE journey.